Black Tourmaline in Quartz Cluster 8.6 oz. 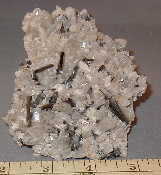 Our Products >> Clusters >> Black Tourmaline in Quartz Cluster 8.6 oz. Copyright © 2010-2019 newagestones.com. All rights reserved.